Perfect…. Dumplings made for afternoon tea and dinner. The filling is from the wonton recipe posted a couple days ago( see link below). Dumpling wrappers from the chilled section at Farros but there is also a recipe for dumpling and wonton wrappers which I’ll save for a rainy day. Altered the recipe to reduce salt. Just sprinkled a bit of fish sauce and salt into Chicken prawn mixture and left out oyster sauce and replaced with coriander and garlic chives from the garden. 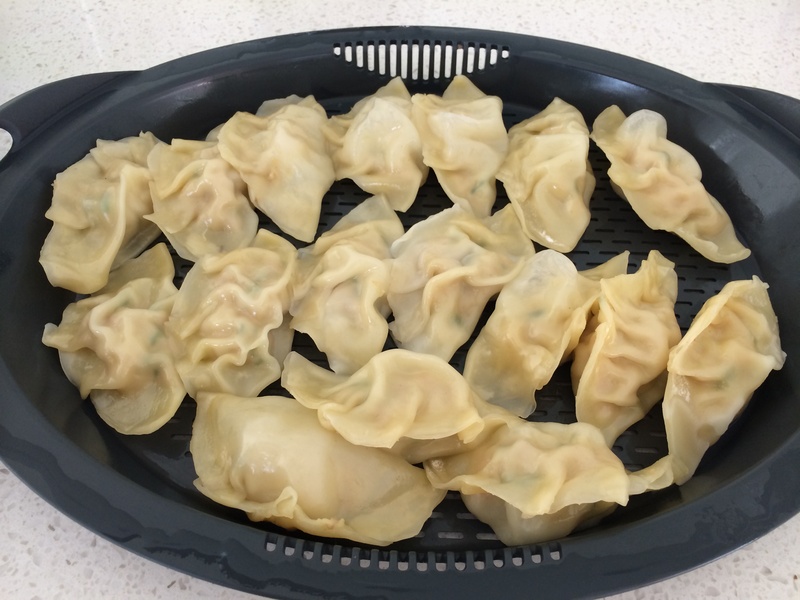 These dumplings were laid in the Varoma basket and tray and steamed for 20 minutes. Again loving the set and forget feature of thermomix. Normally making these required pan cooking in water and time standing at the stove.